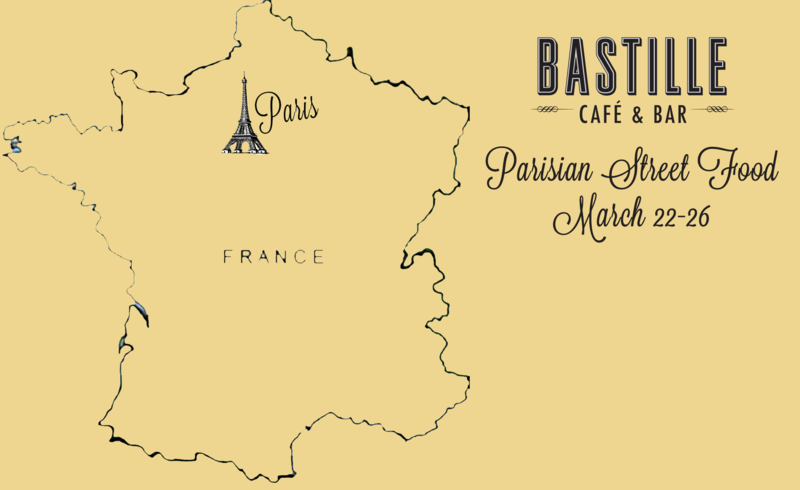 Bastille Café and Bar is excited to continue its new program celebrating the cuisine of famous French culinary regions with Parisian Street Food in March. Weeknights during the third week of the month Bastille is featuring a menu inspired by a different region of France. Parisian cuisine takes influences from many countries well beyond its borders. The people of this diverse city contribute to its ever-changing culinary landscape. The inspiration for March’s menu pulls from these cultural diversities and Chef Stoneburner’s travels and imagination. The special menu for the week includes reimagined Parisian street inspired dishes such as a braised lamb shawarma, salt cod báhn mì, and foie gras éclairs and cocktails with a historical twist.